My husband is so allergic to it – that is basically run for the hills with garlic around your neck and a cross to protect you, if you catch my meaning. Whenever he gets it, I would say, “Don’t scratch that! Don’t rub! I see you. You need to stop before it gets all over the place.” He would bathe in calamine lotion, I mean almost literally. He couldn’t keep his hands to himself. I mean talking about building up tolerance for something that agitates you, this is the stuff. Anyway last week, I notice a little rash on my wrist, not thinking much of it. He was going crazy, but I wasn’t. We looked up what it might be on the web. Was it impetigo, ring worm, or some strange foreign disease that I had acquired? I couldn’t figure it out. I had been pulling weeds, working around the chickens, and raking the yard, with the intention that it would look a little better. My husband kept screaming you need to go to doctor. But, I was like, “Oh, not I. I am not worried. It will go away. 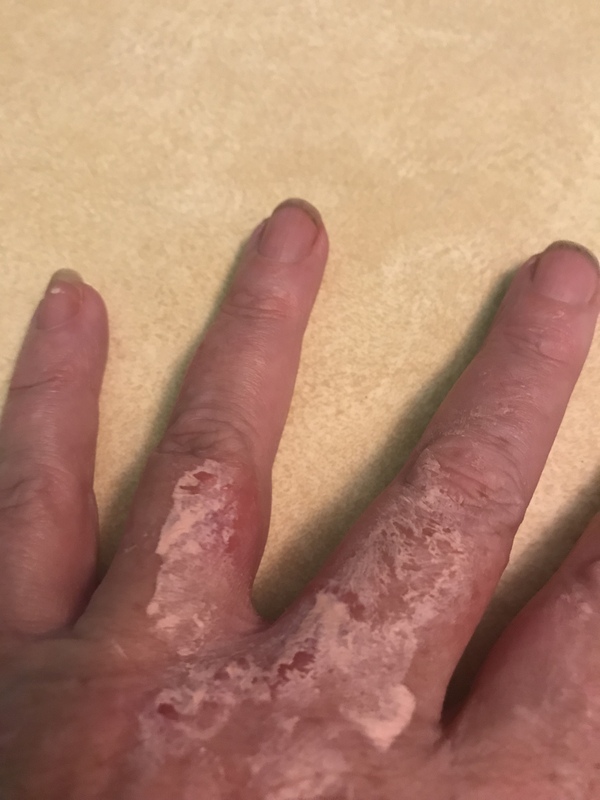 It is just a little rash.” It burned a little bit and had a little circle sort of like ring worm, but just didn’t seem like it. I promised that I would speak to the nurse about it the next day, just to get him off my back. Seriously, it was just a little rash that would go away with a little time. The next day, I met with the nurse. She said that she couldn’t be sure. She said if it didn’t get better in a few days to go see the doctor. So off I went with no care in the world because I was convinced it would just go away. But you won’t believe, by Saturday I started to look like a leper. Furthermore that little burn started to itch like hell. Saturday wasn’t quite as bad Sunday. Oh holy cow! How does anyone live when they get this? How can anyone focus on what they need to get done? Sunday I became a leper. I had spots in places that I know I didn’t touch. I had gotten that evil villain, poison ivy. When I got up, I had it in the corner of my eye, under my nose, and on my cheek – just starting to pop out. No way, this is going to happen with me. Not only did I have it on my left hand in the beginning, it had crept on to strange place that I know that I didn’t scratch. I must have done that in my sleep. I was becoming a pink calico cat or something. I had been invaded by a foreign creature that was beginning to make my life hell on earth. I was itching badly too. I had such great plans for Sunday, and this happens. What am I going to do? I can’t live like this. I don’t know how anyone who is allergic to those villains lives. Anyone who knows me well knows my next move. We are going to fix this. I am not going to live like this. My husband hands me a couple of antihistamines which he explains has helped him. He is so comforting. However, this does not solve the problem. I have to go somewhere that night. They cannot see me looking like a speckled Easter egg. Research time…I began researching the web for remedies which will cause this to go away. I read about the toxin which is released by the plant upon touch, and how it is absorbed into our biological system at lightning speed if we don’t wash it off quickly. I saw herbal remedies and grandmothers’ solutions to curb the spread. And we couldn’t leave out, how long it is going to take to get rid of it (five to twelve days if you need to know). I found out that I needed to smell like a pickle in a fizzy baking soda and apple cider vinegar bath for 20 to 30 minutes three times a day. That was my next adventure. I soaked in the tub for the required amount of time. Subsequently I saw peppermint oil helps to ease the symptoms. I put that on my face, under my nose, on my cheek, and that corner of the eye. I was a little nervous about putting peppermint oil so close to my eye. Nevertheless, I did it anyway. The feeling was a little disconcerting. If you had ever come in contact with peppermint oil, it sort of reminds you of camphor oil in its sensation. Just to let you know, I believe it worked because the rash seems to have disappeared from those spots. I am speaking of the peppermint oil working. Poison ivy has taught me to have patience, endurance, will power, and tolerance. Without all of those, you will blow up like a helium balloon that has a heavy weight holding you to the ground being raked across the blackberry briar patch. If you ever find yourself meeting up with those dastardly poisonous villains (oak, sumac, and ivy), remember to keep calm for this too shall pass. Be patient, learn to endure, maintain the will power not to scratch, and be tolerant in the amount of time it takes to get over it.